This simple chicken cauliflower soup needs only 20 min and is perfect for using up the chicken leftovers from the roast dinner we cooked yesterday. This low carb soup recipe contains just 133 calories and 3g of net carbs. 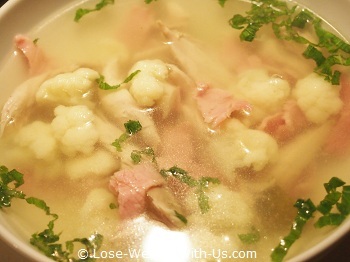 We are going to show you how to cook this chicken cauliflower soup with both cooked chicken and raw chicken. 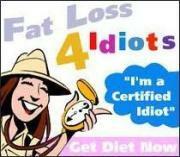 Recipe Nutritional Profile: Healthy Weight, Diabetes Appropriate, Heart Healthy, High Protein, Low Calorie, Low Carbs, Low Cholesterol, Low Fat, Low GI, Low Sodium, Gluten Free, Dairy Free, Good Source of Vitamin C and Niacin. Put all the ingredients except ground pepper into a small/medium saucepan bring it to the boil and cook for 10 min. Serve it hot, sprinkled with herbs and ground pepper. Place 5 tsp. of bouillon powder into a plastic measuring jug, boil the kettle and pour the water in, mixing well with the powder. Wash a chicken leg thoroughly under cold running water, then place it together with the onion, garlic and ground sage into a large saucepan and pour in 1.5 litres of stock. Bring it to the boil, skim, reduce the heat, cover with a lid, and let it simmer for 40 min till the chicken is cooked through. Take the cooked chicken from the saucepan, strain the stock, saving the vegetables (onion and garlic) for later. 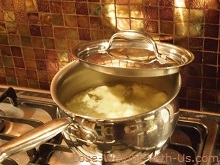 Pour the stock back into the saucepan and reduce it over a high heat boiling the stock for 10 min. In the meantime, take the chicken off the bone and remove the skin. Cut the meat into long strips. 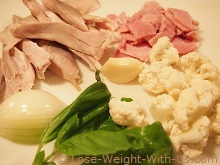 When the stock is reduced, return the chicken, onion and garlic to the saucepan, add cauliflower, ham and cook for 10 min. Serve with fresh herbs and black pepper.